Head protection equipment are designed for workplace safety. In order to ensure safety and enhance productivity, increasing number of industries are using head protection equipment. These head protection equipment are now equipped with sensors, hence along with ensuring safety and monitoring health conditions, these smart helmets are also helping in performing other activities such as collecting data, communicating, etc. Manufacturers are increasingly investing in research and development activities to develop helmets to provide advanced wearable technology that increases efficiency and helps in minimizing workplace injury. Smart helmets equipped with sensors are contributing towards workers safety. High-tech sensors, cameras are also being integrated into helmets to enable users to see within the machines and walls and detect any problem, thereby reducing any errors. 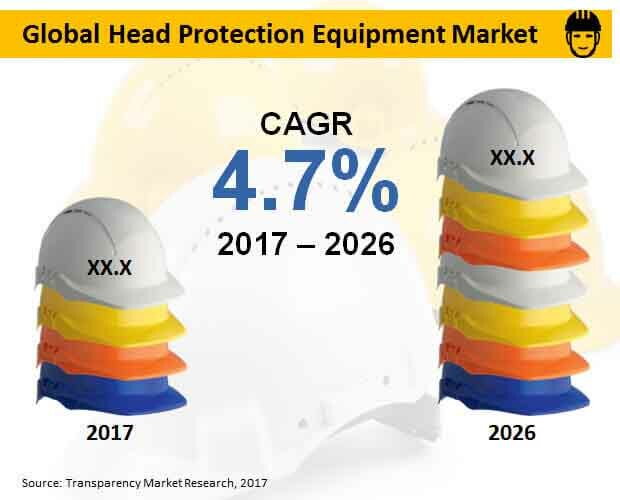 According to a study by Transparency Market Research (TMR), the global market for head protection equipment is likely to see moderate growth during 2017-2026. The market is projected to register 4.7% CAGR between 2017 and 2026, reaching US$ 6,841.3 million revenue by the end of 2026. Class B helmet is likely to emerge as one of the top-selling products in the global market for head protection equipment. By the end of 2026, class B helmet is projected to reach nearly US$ 3,900 million revenue. Meanwhile, class C helmet is also likely to witness growth between 2017 and 2026. Head protection equipment is likely to find the largest application in the manufacturing sector. Witnessing a healthy growth during 2017-2026, manufacturing sector is projected to create an incremental opportunity of more than US$ 500 million between 2017 and 2026. Increased risk of work-related injuries in the manufacturing sector is driving the growth of head protection equipment in this sector. Meanwhile, the construction sector is also likely to witness growth in the use of head protection equipment during 2017-2026. Sales of head protection equipment is likely to be highest through direct (B2B) sales channel. By the end of 2026, direct (B2B) sales channel is projected to surpass US$ 4,600 million revenue. Meanwhile, distributors are likely to account for nearly one-third of the revenue share by 2017 end. Europe is likely to dominate the global market for head protection equipment during 2017-2026. Stringent regulations enforcing the use of safety helmets across manufacturing sector in various countries in Europe is driving the growth of head protection equipment market in the region. Moreover, the presence of a large number of companies dealing in safety equipment including workwear, safety boots, safety helmets, and gloves are also fueling the growth of head protection equipment market in Europe. Meanwhile, North America and APEJ are also likely to witness growth during 2017-2026. Increasing demand for smart helmets and the presence of major tech companies in the U.S. is driving the growth of head protection equipment with advanced features in North America. Increasing number of infrastructure and construction projects in India and China is likely to drive the demand for head protection equipment in APEJ. Some of the key market players in the global market for head protection equipment mentioned in the report are Honeywell International Inc., Bullard, E. I. du Pont de Nemours and Company, MSA, Uvex Group, 3M, Lakeland Industries, Inc., Pinnacle Protection Enterprises, Centurion Safety EU, and Cintas Corporation. Most of the key market players are moving towards producing smart helmets for various industries and are also focusing on developing sensor-equipped helmet as per the specific industry tasks. Increasing number of accidents and injuries is leading to the rising demand for personal protective equipment. Meanwhile, rising number of head injuries in various industries such as construction, mining, power line maintenance, etc., is driving the demand for head protection equipment. Hence, manufacturers are focusing on developing head protection equipment using better materials. With advancement in technology, manufacturers are adding new features, and also designing a product to provide safety and enhance comfort. Increasing use of helmets in various industries has also resulted in improving the design, adding padding to make it more comfortable to wear it all day long. This is being done to reduce fatigue in the neck and make the helmet lighter. The demand for smart head protection equipment, equipped with sensors is also rising across various industries. Manufacturers are creating new devices for active prevention of accidents. The report offers detailed insights into the factors driving and restraining the market growth, various trends and opportunities are also given, major advancements in technology and competition tracking is also provided in the report. The research also offers a comparative analysis and growth prospects of the various segments by analyzing year-over-year growth during the past period. The report provides information on the major factors impacting market growth and that of the regional markets. It also provides information on new technologies in the market. The report offers analysis of the overall head protection equipment market taking into account the various factors such as drivers, opportunities, restraints. Porter’s five force analysis, SWOT analysis, and market attractiveness analysis are also provided in the report. In addition, key industry developments have also been provided. These key industry developments consist of the major events that occurred in the past and events that are likely to take place in the future, which will affect the market. The report also provides detail on regulations in various countries for head protection equipment. The global head protection equipment market is segmented on the basis of product type, application, sales channel, and region. Based on the product type, the market is segmented into class A helmet, class B helmet, and class C helmet. On the basis of application, the market segments include manufacturing, construction, oil & gas, transportation, pharmaceuticals, chemicals, food & beverages, mining, and others. By sales channel, the market is segmented into direct (B2B) sales and distributors. On the basis of region, the global head protection equipment market is segmented into North America, Latin America, Europe, Japan, Asia Pacific Excluding Japan (APEJ), and The Middle East and Africa (MEA). The report also provides a country-wise forecast for each segment, along with the revenue share and CAGR percent for the forecast period 2017-2026. The report offers a detailed profile of some of the leading market players in the global head protection equipment market such as 3M, E. I. du Pont de Nemours and Company, Honeywell International Inc., Bullard, MSA, Lakeland Industries, Inc., Uvex Group, Centurion Safety EU, Pinnacle Protection Enterprises, and Cintas Corporation. The report also talks about some of the key strategies adopted by these companies in order to set their footprints in various regions. The companies are also entering into partnership in order to develop a technically advanced product with enhanced features.